Chicken Tikka Masala recipe by SumeraNawed at DesiRecipes.com. 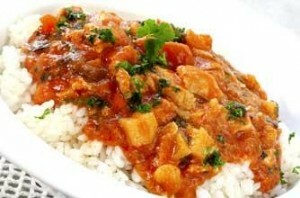 A tasty and healthy chicken curry with the taste of yougurt in it spice up your menu. To make the tikka masala, heat oil in a large skillet with a tight-fitting lid over medium heat. Add the garlic and chili and stir-fry for 1 min. Stir in the cumin, paprika, salt and pepper to taste and continues stir-frying for about 30 sec. Stir the tomatoes with their juices and low-fat yogurt into the pan. Reduce the heat to low and let the sauce simmer for about 10 min, stirring frequently until it reduces and thickens. Meanwhile, remove all the bones and any skin from the Tandoori chicken pieces, then cut the meat into bite-size pieces. Adjust the seasoning of the sauce, if necessary. Add the chicken pieces to the sauce, cover and let simmer for 3-5 min, or until the chicken is heated through. Garnish with cilantro sprigs and serve. paprika is red shimla mirch powder. Paprika is a vegetable which could be red ,yellow or green, sour, sweet or opposite .